Galician author of Hebrew books; born at Dynow, near Przemysl, Galicia, Oct. 21, 1797; died at Sosnica June 5, 1885. When but seven years old he went to Przemysl and thence to Brody, where he studied the Talmud and Hebrew and German. About the year 1830 he became shoḥeṭ at Sosnica, and remained there for the rest of his life. 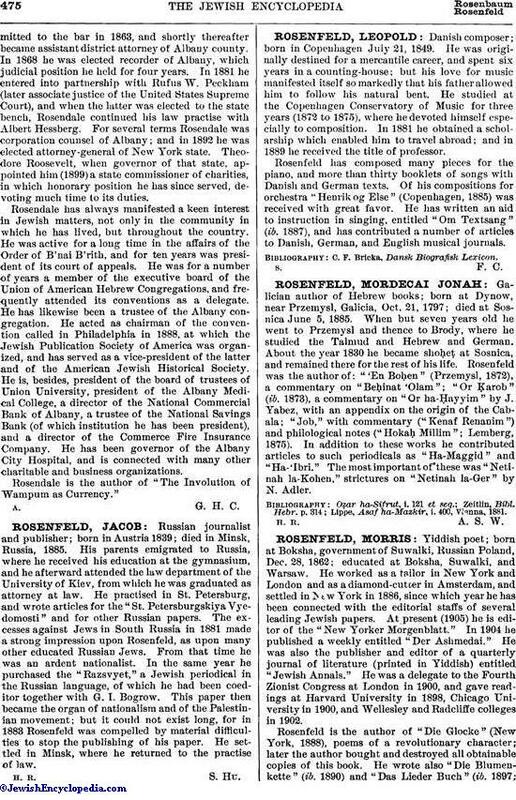 Rosenfeld was the author of: "'En Boḥen" (Przemysl, 1872), a commentary on "Beḥinat 'Olam"; "Or Ḳarob" (ib. 1873), a commentary on "Or ha-Ḥayyim" by J. Yabez, with an appendix on the origin of the Cabala; "Job," with commentary ("Kenaf Renanim") and philological notes ("Hokaḥ Millim. "; Lemberg, 1875). In addition to these works he contributed articles to such periodicals as "Ha-Maggid" and "Ha-'Ibri." The most important of these was "Netinah la-Kohen," strictures on "Netinah la-Ger" by N. Adler. Lippe, Asaf ha-Mazkir, i. 400, Vienna, 1881.